Well, it should have been, OK? Ah right, here we go - into the meat of it! The A556(M) has been a corridor that's been mooted for improvement since the early days. The A556 is, believe it or not, the signposted route into Manchester (and the surrounding towns). Until 2017 it is mostly single carriageway, and people live on it. I mean directly onto it. As in they have to stop on the main road to the south from the UK's third largest conurbation in order to turn into their drives. It was pretty hairy stuff, and really needed something doing about it. It certainly didn't feel like the safest road in the world, that's for sure. Well, the idea of a motorway to relieve the A556 has been around for many, many years. It's mentioned in the SELNEC Highways Plan of 1962. It then alternately disappears and reappears, often as part of a larger plan that gets cancelled, but then it comes back in its own right, then gets lumped in with something else again, then disappears again.. It was worse than you can possibly imagine. There was even talk of improving the M6/M56 junction to the north to allow full access between the two, but that's several miles out of the way. Traffic running between the M6 from the south and the M56 towards Manchester is not catered for at the M6/M56 junction. Instead, this traffic is directed to leave a junction early and follow the A556 through the villages of Mere and Bucklow Hill. The desperately needed bypass for this route has been planned for some time. Will it be built? The Highways Agency said yes. Then, they said no, we'll have a study into altering the M6/M56 junction first. The study said the A556 motorway link was best, so the Highways Agency said yes again. And then, just as they started sharpening their pencils, Alastair Darling became Transport Minister and said "no, stop that lads, I've got an idea. Why don't we look into altering the M6/M56 junction instead?". I don't know about you, but I'm banging my head on the desk here. Finally, due to open in Spring 2017, the A556 was upgraded to dual carriageway on a similar line to the proposed motorway, so after a 40 year gestation period, the nails were finally hammered into the coffin of the A556(M). So where exactly was it meant to go? As you might imagine, it's moved around a little, though generally the majority of the motorway was planned to be to the north of A556. 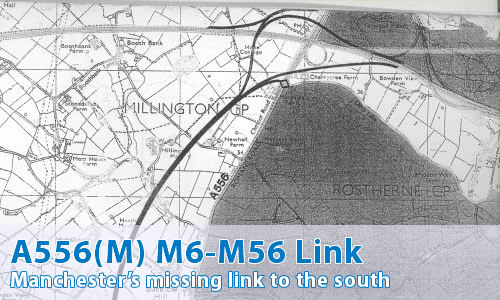 The 1960s plan involved leaving the M6 just north of J19, and then heading across to what became M56, just to the west of the current J8 loop. That's the 1960s. How about something more modern? OK, the 1990s plan left the M6 just south of junction 19. And yes, this would have involved demolishing Knutsford Services! It would then have crossed the A556 between Church Farm and Moss Cottage, and passed between Gleaveshole Wood and Square Wood. It would have skirted the western side of Kennel Wood and the Mere Estate, crossed the A50 and headed northwards to meet the M56 at the junction 7 and 8 complex. Hi - maybe a bit of info that might be useful - in 1992 I was working at a business just off the A556. The Department of Transport had detailed plans to build a replacement road. They had three plans - upgrading the current road, building a new road or a mixture of the two. The widening was ruled out because it required purchasing about 60 properties - and the properties along the road are worth a million or two each. The route they proceeded with was a new motorway (I don't know if 4 or 6 lanes) about 300 yards to the west of the A556. I don't know what they planned at either end in terms of junctions. They went as far as buying a house on Millington Hall Lane as a site office and producing a badger relocation plan! The challenge with building with this road is that is cuts through land either owned by the Tatton Estate or wealthy individuals. I'd also suspect that someone has worked out that the A556 is a useful bottleneck to reduce the flow of traffic - the M6 for southbound and the M56 northbound probably couldn't cope with the additional volume. I regularly have to drive down this road in order to visit Birmingham from Manchester. In what is a hideous drive anyway, down the car-park that is the M6, the A556 is probably the worst bit of the journey. The two traffic light sections are virtually always a total bottleneck. It can often take the best part of 40 minutes to do the 6 miles between the M56 and M6. If there's an accident the whole situation backs up onto the M6 or M56 making those routes even worse. How people actually live on this road I'll never know. The sooner the eejits at Whitehall pull their fingers out and sort out the building of the A556(M) the better. As of early April 2007, this classic 'on/off' scheme is being revisited yet again. Outline plans are for extension of the existing short sections of two-lane dual carriageway largely on the current line of route except for a short by-pass of the section around Mere corner traffic lights. It is not clear from the outline whether the poorly laid out junctions at both M56 and M6 intersections will be altered, but it looks unlikely. Thus whatever improvements are made will be rather negated by the inevitable queuing at the A556/M56 roundabout since flows to/from Altrincham conflict nicely with the Birmingham/Manchester flow at that point. I used to travel the A556 in the mid 1980s on the way to work in Stockport. And never mind the people living there - there's a farm along there that has fields across the other side of the road where the farmer used to keep his cattle. Once the herd had crossed, everyone would roar off full throttle to their destinations. This silly badger would repeat the performance so that it took place four times a day. The state of the road by the time the return journey of the herd of an evening took place can only be imagined. As this hero waved his flag, and desperate cars and desperate drivers hammering on the anchors, cars sliding across the carriageway on the remains of the cow ... er ... dung from the three previous crossings, the chaos cannot even be imagined. I suspect that the main reason the motorway hasn't been built is due to pressure from the locals, but not for the reason you might think. How much would you have to pay to get entertainment like this?